Bacon, edamame and cheese sandwich | Is Life a Recipe? Yes, the usual food emergency occurred again today. We had had a lovely afternoon at East Coast Hawker on the beach. We arrived home to get Jude settled – yes this was a few years back that I created this dish. 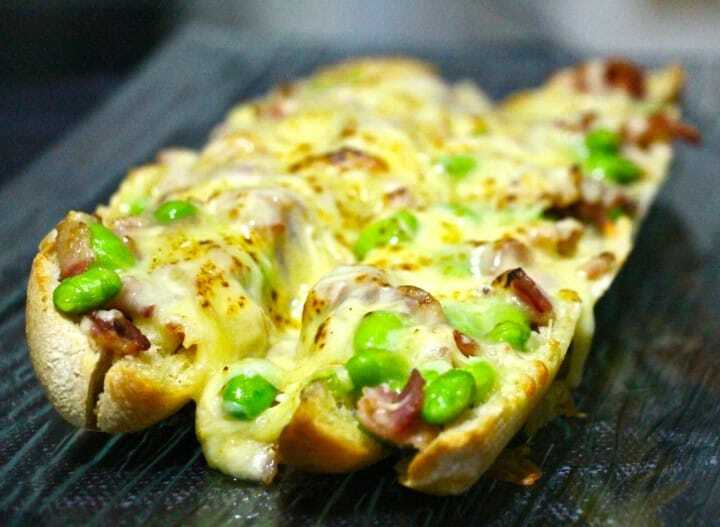 But then “Oh no, we have no food…” So I created this open sandwich, my bacon, edamame and cheese sandwich. Looks and tastes amazing – loving this!!! My Bacon, edamame and cheese sandwich came out looking pretty damn good. It also tasted pretty damn good too. The kids loved it too. They wolfed down a whole 3/4 of a baguette plus toppings, can you believe it? Pop it in the oven @ 250 until the cheese has melted and is starting to brown. Out of the oven. Serve whole on a chopping board, with a knife for everyone to carve off a slice. It’s easy to do. It looks great. And believe me it tastes delicious. This was a new one for me, my Bacon, edamame and cheese sandwich. Have a go. It’s a cracker – I just know you will – ENJOY!!! No Replies to "Bacon, edamame and cheese sandwich"